When I first came across Mr. Money Mustache’s website, one of the most interesting articles I found was about what he is teaching his son about money. I think he’s doing a standup job and his son will have a wealth of financial management knowledge when he goes it on his own after he becomes an adult. Reading this post, I couldn’t help but think about my own experiences as a child. This ties in with something I briefly mentioned in my previous post: opportunity. Opportunity, I believe, is something that you can make for yourself but in more cases than not it is something that we have no control over. For example, a series of random, lucky occurrences put in front of me an opportunity to secure a job that launched a career I am thankful to have and that has helped me and my family immensely. The opportunity wasn’t evident right away, but I felt it could be there, took a chance, and am lucky to have been right. In more cases than not, I believe what you do with the opportunity that’s in front of you will determine the level of your success, happiness, or allow you to reach a goal. However, opportunity doesn’t show itself to everyone all the time. And even when it does, it is random and not everyone can recognize it for what it is. It also usually has nothing to do with a person’s individual abilities. A person born into the right family, at the right time, and in the right place didn’t do anything special to have the opportunity they did. It was just random luck and doesn’t make them more special than anyone else. A great example are socialites, the offspring or relatives of extremely successful and rich people who do nothing but engage in social activities, which may or may not lead to success. Paris Hilton is one such example. Do you think she would have really garnered the attention and success she has if she did not receive a torrent of opportunity because of her birth into the Hilton family right at the time when the Internet and social media was taking off? I would wager that she wouldn’t have. Looking at Mr. Money Mustache’s son, I’m not going to lie: I’m envious at the opportunity he has been given. He is naturally learning about effective money management and investment. He has wonderful role models in his parents who are teaching him about the differences between want and need and how he can also enjoy financial freedom when he is an adult. My experience was just the opposite. I had the worst role model you could ever imagine. Growing up in a strict religious family where the mother has no say in anything, my father managed the finances. He only knew about want. If he wanted something, he bought it, even if he didn’t have the money. His family’s needs suffered. I learned about bounced checks at an early age, and I can’t tell you how many times our payments were rejected, cars repossessed, or we were unable to purchase groceries because my father spent the money on something he wanted instead of something he needed. It wasn’t like he didn’t make money. He actually made a lot of money. The problem was, he liked expensive things and if he had $10 in his pocket he spent $15. My family lived under constant financial stress. My older brother and I were keenly aware of this stress as my father did not hide it from us. Being 14 years old and constantly worried your family would lose everything is not fun. Our house was refinanced so many times and constructions projects were ongoing to make the house bigger, and my father had no problem telling me this was so it could be reappraised and refinanced again. No refinancing meant no money and this meant we lose everything. Growing up, I was taught that loans and credit cards were the solution to most financial problems, and that we would worry about paying them back another day, if at all. There was always bankruptcy. A perfect example of the role model I had was when my mother finally convinced my father to sell his $70,000 Mercedes Benz. The monthly payment was too high and this was clearly not a need, but a want. It was constantly in risk of being repossessed anyway (I remember moving our cars around frequently so they couldn’t be found by the repo company). My father made his way to the dealership to trade in the Mercedes for something cheaper. My mother was relieved. Unfortunately this didn’t last long. My father returned with a cheaper Buick, but also a second car – a Chrysler Sebring Convertible. Yes, he traded in one car for two, and the payments on both of the cars were more expensive than the single Mercedes payment. But, my father argued, thanks to a promotion at the dealership the first payment for both of these cars wasn’t due until two months later, and by that time surely we’ll be out of our financial troubles. So yes, I’m very envious of the opportunity Mr. Money Mustache has given his son. I’m envious of the wealth of knowledge he will bring with him as he becomes an adult. When I went into the world, I had no financial sense at all, and knew nothing of saving, investing, or proper money management. It took me years and mistakes of my own to learn this. If you can start your adult life with the opportunity to have intimate knowledge about how you can achieve financial freedom – and if you capitalize on that opportunity – you start things off with a significant advantage. If I ever have children someday, I hope to also be able to give this opportunity to them. 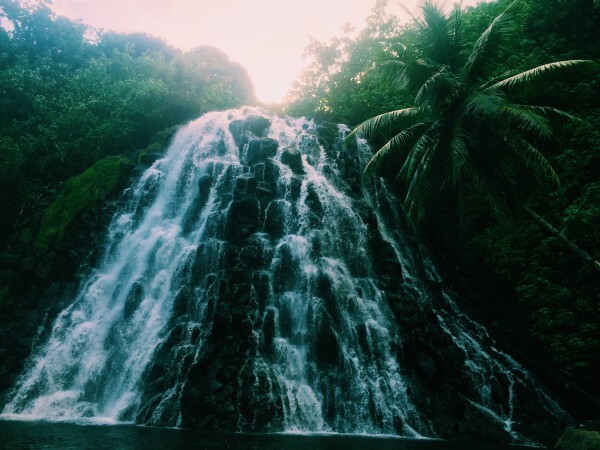 Photo: Kepirohi Waterfall in Pohnpei, Federated States of Micronesia. I took this photo during my time in Pohnpei in 2014. I have a better one somewhere.